I haven’t been naming my quilts beyond descriptive terms (Tetris Quilt, Mother’s Day Quilt, Chickens, etc), maybe it’s time I start giving them names like actual pieces of art. I finished the baby quilt for a coworker and I love it. I know everybody always says they love whichever quilt they just completed, and it’s true. 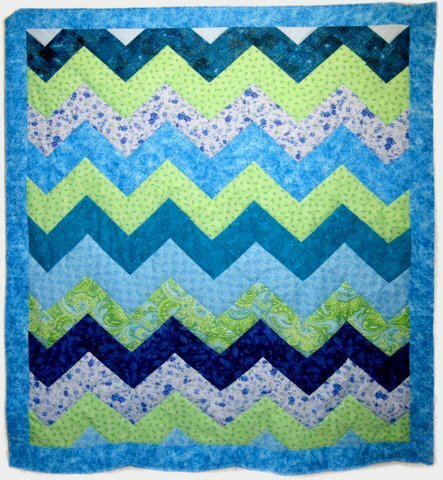 I actually quilted this one, too, rather than tying it, doing stitch-in-the-ditch along the edges of the zigzag stripes. It went really well. The backing is a soft dinosaur print flannel. Maybe next time I’ll even add a real binding! August 4, 2009. 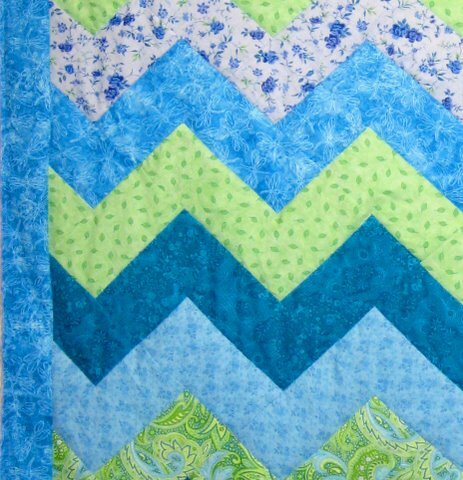 Tags: baby quilt, blue & green, completed project, quilt, zigzag. Pictures, Projects, Words. 1 comment.